Sign-on day Thursday 18th April. The Green opens on Saturday 20th April. Click here for the Match Fixture list. Click here for the League fixture list. Club roll-ups are on Thursdays at 2.30pm, during the bowling season. 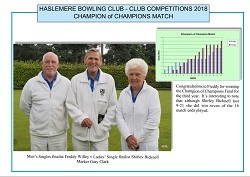 The Haslemere Bowling Club is based in Surrey, England, founded in 1911. We play a range of social tournaments and compete against other clubs in the area. The season runs from the middle of April to the end of September. There is a full programme of club competitions and friendly matches against local clubs. The Club has a well kept green in a delightful setting with spectacular views over the Surrey countryside and a fully equipped clubhouse. The green is on the Recreation Ground, Old Haslemere Road, Haslemere, GU27 2NN. Click here for a scalable map. If you would like to join, please fill in the application form which gives details of the subscriptions and where to send the cheque and your form. 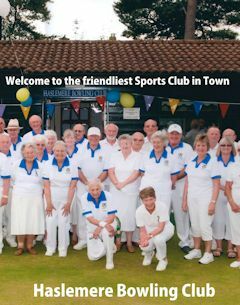 The club is affiliated to Bowls England, Surrey CBA, SCWBA, WSBA, Three Counties Bowls Fellowship. Click for a document describing the object of the game. We welcome players of all ages. Try it out! Anyone interested in playing bowls for the first time is welcome to come along to one of the roll-ups (Thursdays at 2pm) and receive some informal friendly instruction. All you need are flat soled shoes and enthusiasm. Experienced players are also most welcome. Note: Many of the documents on these pages are PDF (Acrobat reader format).